This is a 1 vs 1 Skirmish map. It is a Blue Zone, with enough Tiberium Spikes to have 3-4 of them per player, but there are lots of bunkers. There is a desolate village a bit left from the center. While the detail level may not be as fine and accurate as most top-class maps are, I spent lots of hours figuring out which textures to use, as well as putting all the objects on the map. 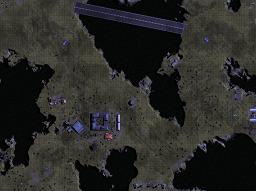 There are also a couple of Tiberium Silos in the southern part of the map. You know the drill, get them ASAP. Oh, and there's an EMP Structure too. Make sure not to miss that.